NOIPolls is Nigeria’s premier public opinion polling institution, which conducts periodic opinion polls, surveys and studies on socio-economic and political of diverse issues in Nigeria. More information is available at www.noi-polls.com. The poll was conducted between July 9th and 12th 2018. 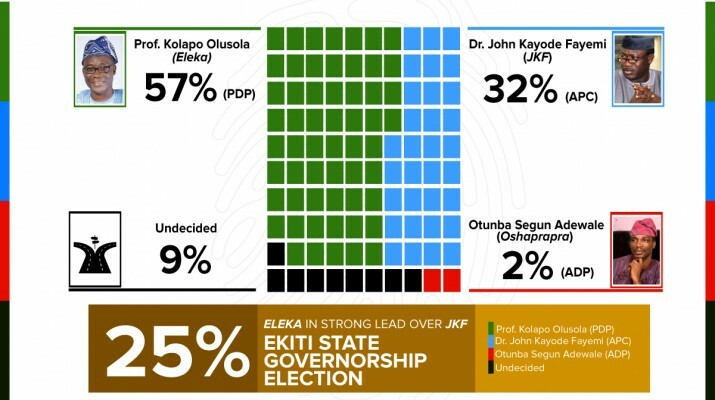 It involved telephone interviews of a representative random state-wide sample in Ekiti State. 1,000 randomly selected phone-owning residents of the state aged 18 years and above, representing the three senatorial districts of the state, were interviewed. With a sample of this size, we can say with 95% confidence that the results obtained are statistically precise – within a range of plus or minus 3%. Of the 1,000 completed interviews, 51 percent were male and 49 percent female respondents. 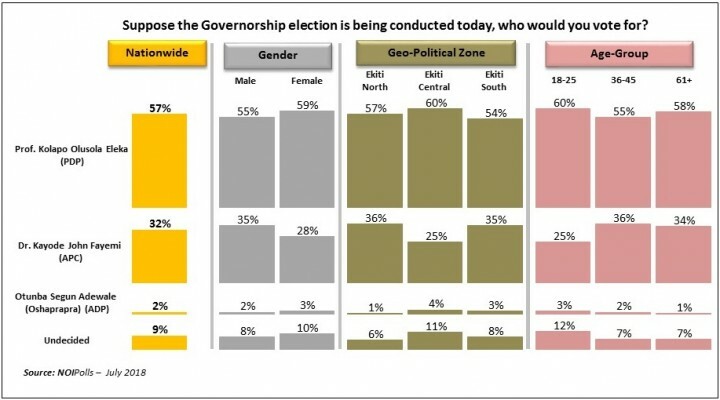 Samples for the poll were selected randomly for the senatorial districts in representation of the state’s population – Ekiti Central (41 percent), Ekiti South (33 percent), and Ekiti North (26 percent); with interviews representatively conducted in all the 13 LGAs of the state. Also, 39 percent of respondents were aged between 18 and 35 years; 54 percent between 36 and 60 years; and 7 percent above 61 years. In terms of employment status of respondents, top 5 respondents are: Self-employed traders (31 percent), Civil servants (22 percent), Unemployed young people (9 percent), Business men/women (9 percent) and Students (8 percent).